BTW, I'll be off riding The Big Lebowski 600K in Oregon this weekend. With luck I'll have some tales to tell when I return. I've logged a lot of fixed and single speed miles over the years but the bike I'm riding the most these days is this beat-up old orphan Bianchi mountain bike. The Bianchi has three chainrings up front, seven decadent gears in the back and deraillers, so of course my fixed and single speed pals tell me that I've gone soft. Maybe I have, but for now I'm having fun scooting around on the Bianchi. But there has been a problem, most of my bikes wind up having some kind of a name, not a personification exactly but more a shorthand that sums up the bike. My Monocog pretty much always will be the Monocog and the Kogswell seems sufficiently Kogswellian but this Bianchi mountain bike doesn't seem like a Bianchi to me. It's not celeste, it's not an Italian road machine and it doesn't have a bit of Campy gear anywhere on it. It may have a Bianchi sticker on it somewhere under all the stickers I've added to it but it doesn't feel like a Bianchi. It's something else, something I haven't quite identified yet. If you value your sanity, you won't click on the above link. Alas, I did not follow the advice in the above sentence and I have had the wretched Strawberry Pancake song stuck in my head for weeks and I have this bike that is sort of strawberry colored (and the crossbar's real low). Something needed to be done. In an effort to clear my mind, I regressed to my wasted youth (as Meatloaf noted "a wasted youth is better by far than a wise and productive old age") and have been running classic rock through my head and digging through what we used to quaintly call "albums." The title of the album was an inside joke. Clapton had been thinking of getting a racing bike and was discussing it with Baker, when Mick Turner, one of the roadies, commented on the performance of "those Disraeli gears", meaning to say "derailleur gears". The band thought this was hilarious and decided that it should be the title of their next album. Had it not been for the roadie's malapropism, the album would simply have been entitled Cream. So what bike am I taking down to Oregon this weekend? Not the Bianchi. Not the Strawberry Pancake. Nope, I'm taking the bike with those Disraeli Gears. 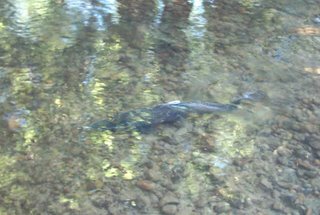 Every autumn the salmon return from the sea and swim up the Issaquah Creek. We have a salmon hatchery downtown and the first weekend in October there is a big street festival called Salmon Days. 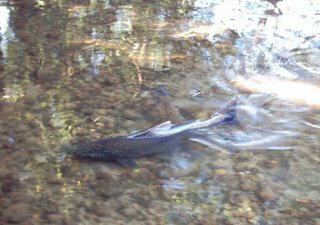 But the salmon have their own schedule and they are already returning. I hopped on my bike this afternoon and snapped a few pictures with my cheapo digital camera. The late afternoon light under the Dogwood bridge made the water glow. 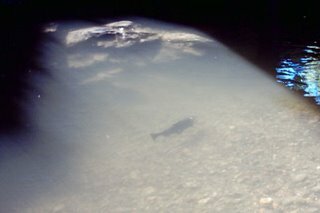 It took a few tries to get a shot of a salmon swimming in the light. The salmon really have to struggle in the shallow waters of the creek. The salmon range in size from about 15 to 30 inches long. 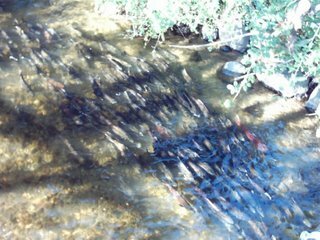 Near the hatchery the salmon pack the creek much like cars pack in on Front Street at rush hour. 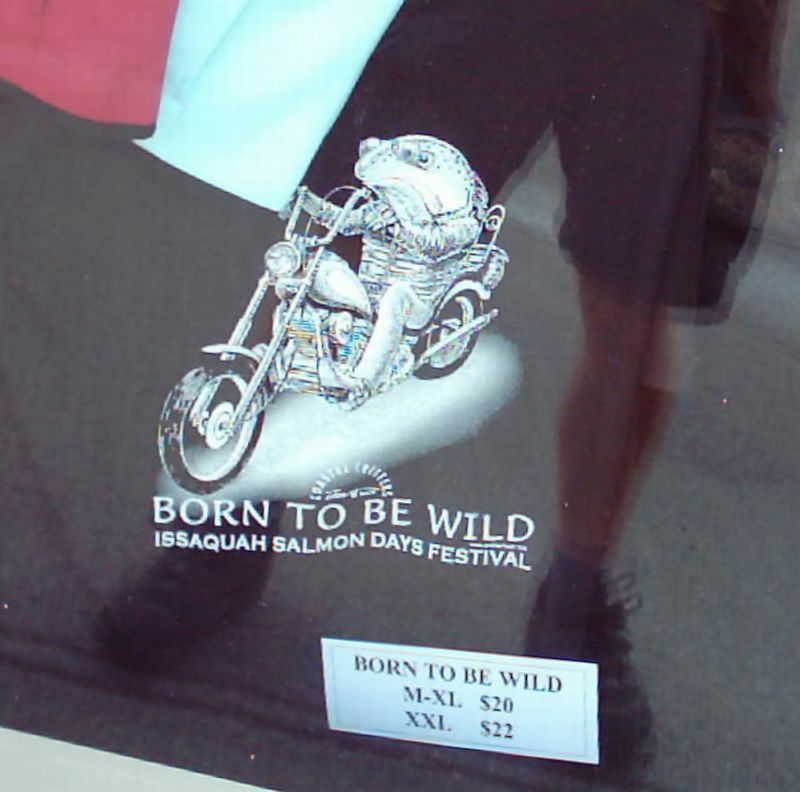 The salmon motif is all over Issaquah. 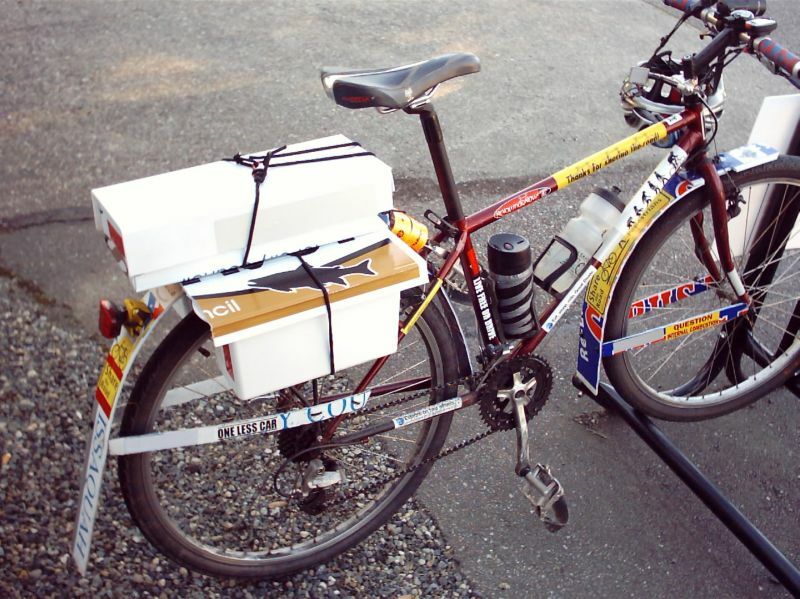 My panniers are made from recycled coroplast campaign signs and here you can see the salmon that was part of last year's campaign. This year's slogan is "Born to be Wild" and one of the "Ofishal" Salmon Days T-shirts features a fish on a chopper. Salmon Days is one of those corny small-town things that fills the town with tourists and a lot of us local folks try to lay low until it's over. Soon the tourists leave and the fish all die and the town stinks like hell for a few days. Then the gulls and the rains come in earnest, strip away the last of the carcases and we spend the winter sipping coffee, riding in the rain and watching the mists cloak the mountains. A study in the U.K. made the news recently, primarily (I think) because it fits so well into our "fearful soundbyte" model of news presentation. So televisions have been blaring with well-groomed talking heads saying things like "Is your bicycle helmet putting you at risk? Find out at 11:00!" The Walker study of 2,500 passing cars showed that test cyclists were given 8.5 cm (3.3 inches) more clearance by cars if they were not wearing helmets and the alarming headlines quickly followed. I think you make a good point that I seem unable to follow: being more aggressive in taking the lane as opposed to the extreme right position on the road. It makes a lot of sense to make cars "see you" in the lane so they supposedly have to venture into the opposing lane to pass you with sufficient space. Riding with my friend Paco, who is a seasoned racer and does many training miles on the road, I find it very uncomfortable to follow his technique of taking the lane so aggressively as I ride close on my right. I find that cars tend to get more ticked off at him than me, though, as they cannot pass until they have clear room from the opposing lane. It is true, however, that cars seem to squeeze closer to me than to him, though I've never felt in danger in my position. Very interesting idea to think about and work through. I think keeping far right does encourage people to pass close, but sometimes that is what you want. When I am riding in light to moderate traffic, where passing is not difficult, I will take the lane because that is safer. However, if traffic is heavy, I will do every thing I can, including getting off the road periodically, to help cars and, especially, trucks, get by me. Under those circumstances, I think taking the lane is rude and, while possibly safer for me at the time, will anger drivers and increase the chances that they do something unsafe for bicyclist in the future. Riding a bicycle safely in traffic on the road requires cooperation between the cyclist(s) and the drivers. Both groups need to recognize the rights of the other group and act in ways that help the other group share the road with them. Taking the lane can be a good thing or a bad thing. The experienced rider should be able to decide which it is in any given circumstance. I follow the rule that, in traffic, I should ride as near the edge of the road as practical. It is up to me to judge where that is. It can, and does, change as road and traffic conditions change. It can, and does, depend on the drivers behavior. If I 'give' drivers the lane because they need it to get past me and the result feels dangerous to me, I'll take it back again or, in extreme cases, get off that road. Like Mark, I try to ride safely and courteously. All of us on the road are trying to make our way in the world. It would be great to live in a world where we don't need such things but even though most people are good, there are enough rat bastards out there to make things like locks and stolen bike listings something we all have to deal with. And if you see a really sweet orange 56cm Rivendell Rambouillet with shellacked brown cloth tape on handlebars and a tubus luna rack, good-guy philosopher Dave Shapiro would love to hear from you. I'll be presenting a couple of bicycle commuting seminars on the next two Mondays. If you are in the Seattle area, feel free to stop on by. I'll also be posting written notes on these subjects shortly after the seminars. Description: Practical advice on how to equip you bike and your body for commuting through the dark and the damp. Description: A discussion of what tools to carry and how to use them to deal with flat tires and other mechanical challenges. Both of these after work seminars are free and open to the public. No prior repair or commute experience is required. It was the key to keeping laces out of the drivetrain in the pre-Velcro days of yore. 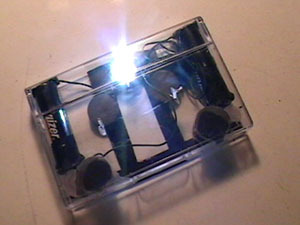 But really if you value your time at all, there are lots of LED headlamps, flashlights and bikelights that fall into the sub-$20 pricepoint of this project. So why am I posting this here? Well, it is kind of nifty. And I'm thinking maybe you clever folks in the blogosphere will add a bunch of neat comments with links to your own home-brew lights and/or great bargain bike lights you've discovered.